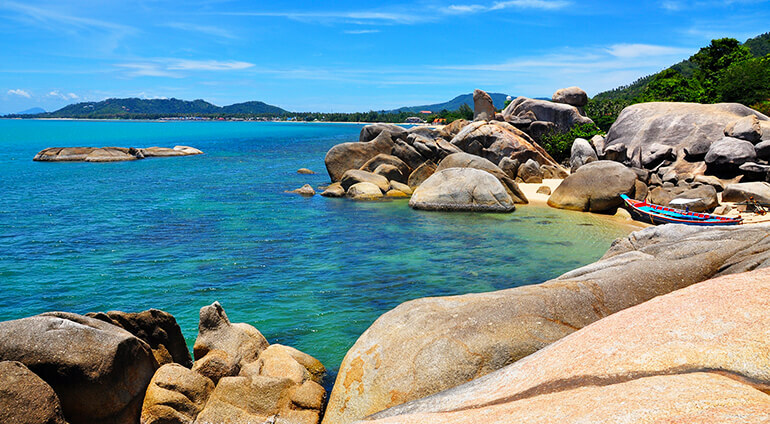 Many visitors come to Koh Samui just for the beaches and it’s easy to see why. Chaweng, the longest and most beautiful beach on the island, is the resort’s most popular spot. While there’s no shortage of sunbathers or boats, the powdery white sand here remains clean and the waters a clear turquoise. This is also the area where you’ll find the best amenities on the island, with plenty of bars and restaurants to choose from. Koh Samui’s second biggest beach resort is Lamai, home to some of the island’s older and therefore cheaper accommodation and a favourite with backpackers. This laid back beach is steadily getting an upgrade however, with some bigger and boutique hotel chains moving onto the stretch. Make sure you look at for local landmarks, Hin-Ta & Hin-Yai, at the end of the beach. Known as Grandfather and Grandmother rocks, their shape means they are a big draw for lots of giggling tourists. The area of Bophut beach is home to the famous Fisherman’s Village, where there are wooden Chinese shop houses right on the beach, an excellent Friday Night Market and a smattering of upmarket restaurants and boutiques. Those who fancy something slightly more active should visit the Ang Thong National Marine Park, an incredibly beautiful group of small islands where you’ll find lots to explore, including hidden lagoons, lush vegetation, white sandy beaches and numerous caves and crevices. Many will recognise Ang Thong as the location for the move adaptation of Alex Garland’s novel, The Beach, something which only adds to its utopian feel. Diving and snorkeling enthusiasts will find plenty of dive schools on the island’s beaches. Stunning from above, the Ang thong National Marine Park is even more spectacular under the water, offering the chance to see colourful sea fans, large barrel sponges and bushy corals, as well as shoals of banded angelfish, snappers and groupers. Back on dry land, it’s worth journeying away from the beaches to the centre of island to discover Nam Tok Na Muang, the tallest waterfall on Samui. The water cascades 30 metres onto colourful rocks, with a pool perfect for swimming at the base. There are also plenty of religious sites to visit on the island, possibly the most visited of which is Wat Phra Yai, found on a small island linked to Samui but a causeway, known as The Big Buddha Temple. Equally as photogenic is Wat Plai Laem, with its enormous 18-armed Buddha. Others of note include Wat Hin Lat, close to waterfalls of the same name, Wat Samret, which boasts a Buddha carved from solid marble and Wak Khunaram, where a mummified monk watches over proceedings, complete with sunglasses.